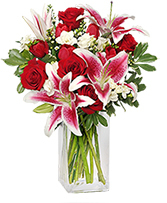 Express true love and heartfelt emotions with our Eternally Yours Valentine's Day Bouquet. 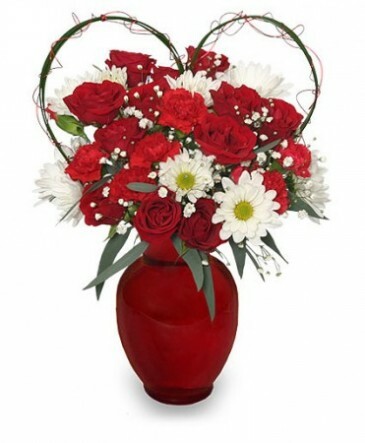 Order Valentine flowers online - anytime, day or night - or call Our Flowers to send Valentine's Day flowers to the one you love the most. 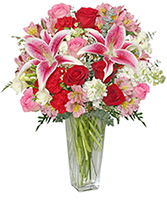 Along with rich red roses, this SWEETLY-SCENTED bouquet features Stargazer lilies and white freesia that will leave a soft fragrance in the air. 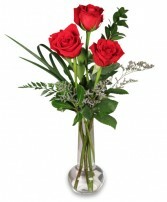 Call Our Flowers or send flowers from our website anytime.